How Big, How Blue, How Beautiful, Florence & The Machine-Was anyone expecting this not to be here? Florence returned to the music scene after a bit of a hiatus and it did not disappoint. Perhaps slightly less melancholy in tone than some of her other albums, there's still the soaring vocals that we know and love as well as some amazing orchestrations. Those horn sections make me so happy, I can't really explain it. I think I've mentioned this already on here but in my imagination, this is the ideal US roadtrip soundtrack. Standout tracks: Caught, Delilah, How Big+How Blue+How Beautiful and Queen of Peace. Maybelline ColorSensational Rebel Bloom Lipstick in Blushing Bud*, out July-Maybelline have some wicked launches headed our way next month but more on that soon. Some of the standouts for me though have to be these new ColorSensational lipsticks. Creamy, longlasting, vibrant colour all inspired by Spring/Summer blooms are what you'll find in this collection. Blushing Bud is the perfect rosy pink and reminds me of the colours essiebutton wears on her lips. Hibiscus Pop and Power Peony are next on my wishlist. Secret Garden by Johanna Basford-Colouring for grown ups has really taken off recently which is mainly down to Johanna Basford's intricate colouring books. These drawings are so detailed and you can really unwind for a good hour or two completing these illustrations. I also find colouring in so relaxing and really zone out from any distractions. It's great. Nars Luminous Weightless Foundation in Mont Blanc-I never thought a fuller coverage base would take my fancy but the newest foundation from Nars seems to have changed my mind. This foundation is so lightweight, it feels like you're wearing no makeup at all. I also love how flawless it looks on the skin. My favourite thing about it though is the fact it stays put really well without powder. Seriously, I powder maybe once or twice during the day if I'm wearing this. There's also a really wide range of shades available too and if you have combination or oily skin, you'll probably get along well with this one. Max Factor Masterpiece Glamour Extensions Mascara*-This mascara has been my holy-grail since I ran out of Roller Lash. I curl my lashes first, apply this and then it's like bam, hello fluttery elongated lashes. It really does hold a curl well throughout the day and is fairly water resistent even though I don't think this mascara is waterproof. Max Factor mascaras are pretty pricey here in NZ but I think they do some of the best 'drugstore' priced mascaras around so they're worth the hype. The Goldfinch by Donna Tartt-So finishing this book has been a long time coming. 800 hefty pages does take a while to get through. 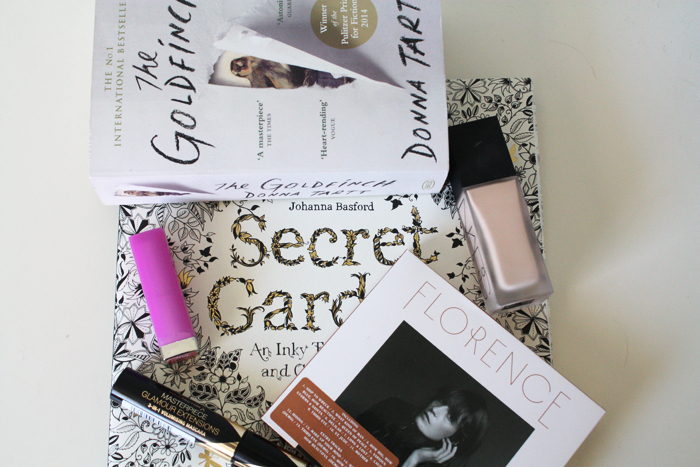 I've read The Secret History which is also by Donna Tartt and really enjoyed that and The Goldfinch was just as good. I had no idea what this was about going in and really had no clue what was going to happen in this book which I think appealed to me most. I like a non-predictable storyline. This story also takes place through a number of different time periods and is mainly set in New York which I liked as well. I highly recommend this if you like mystery, drama-laden novels. -What did you love throughout June?